Almost all of those assumptions are untrue. Defense in the NBA is actually pretty intense on most nights. Yes, there may be some thugs, but show me any professional sport that doesn’t have its share of bad apples (I’m looking at you, NFL.). There are some isolation plays, but no more than you would see in the average college game these days. And with the internet, apps, and 24-hour sports television, a person can basically be a follower of any sport they want. To me, the best example of how entertaining the game of professional basketball can be is the San Antonio Spurs. Granted, the Spurs have not quite been the juggernaut they were in the NBA Finals last June when they were steamrolling the Miami Heat, but they do still possess the sixth-best record in the loaded Western Conference this season. But, my goodness, the Finals! I don’t know that I have ever seen a basketball team, professional or otherwise, share the ball like the Spurs did in that series. It was a beautiful thing to watch. I had a chance to watch the Spurs play the Chicago Bulls today on ABC, and I was reminded of that series. In addition to the ball movement, though, I remembered another thing that always amazes me about the Spurs – the way they can fit nearly any player into their structure and turn him into a valuable part of the team. I’m not saying players like Boris Diaw, Tiago Splitter, and Patrick Mills aren’t talented, but would they have the kind of impact on another team that they do for the Spurs? It’s difficult for me to imagine they would. 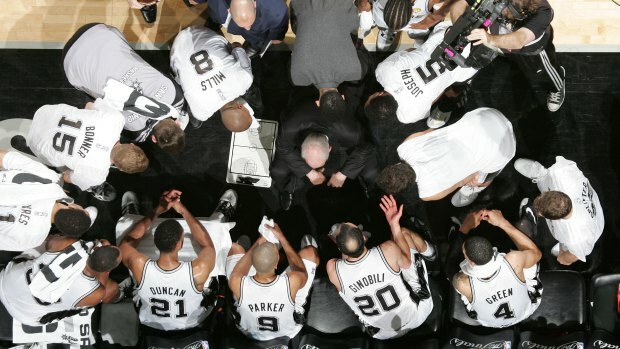 Even though I feel like the term is overused these days, the Spurs certainly posses a “system” of some sort. Everyone seems to know their roles. They seem to get along with one another. They don’t mind taking a backseat to each other. They don’t appear to be selfish. And despite the fact that they’re getting older (by NBA player standards), they keep on winning. Whatever the system is in San Antonio, it works. I’ve wondered for years how certain people can be total failures in one place and then go on to success somewhere else. I think maybe my bewilderment stems from never quite feeling like I fit in. Everyone has weaknesses, everyone has flaws, everyone has strengths, and everyone has areas they excel in more than others. Somewhere inside me, I’ve always felt I work better as a part of a team, drawing upon the strengths of others to make up for where I am lacking. I have been looking for a system. There are definitely times when we are forced to stand on our own. For instance, being a writer forces you to put yourself out there in a very individual kind of way. Even outside of work-type situations, though, there is a system somewhere we’re all looking to plug into. It may be a lifestyle regiment to bolster us. It may be a support network of friends. It may be a regular routine of giving. Whatever it may be, it involves accentuating strengths and reducing weaknesses. It reduces selfishness. Most of all, though, it wins. I haven’t found my system yet. I’ve caught little glimpses of here it here and there, but it never seems to last. I either break it down myself or someone or something else does along the way. When I see a system working, though, it gives me hope that the right one is out there for me somewhere. It may take me a while longer yet to discover. Even the Spurs weren’t always the way they are now, and they don’t win a championship every year. A system that works, though, is a winner every time, if you ask me.